No, the photo above isn't a mistake, it's a comparison that Tony Abbott may choose to mull on. Here's Tony Abbott, at about the same time into his Prime Ministership. Sorry I haven't kept this blog up to date. My New Year's Resolution is, of course, to do so . . . Normally, governments receive a poll boost over the Christmas period. Tony Abbott hasn't. This column examines why . . . The polling is evidence: Tony Abbott has a problem. Enthusiasm for his particular government has fallen more precipitously than for any other administration since Billy McMahon, and that really is a reference to the Dark Ages. The problem isn't the occasional (high-profile) resignation by a (low-ranking) public servant; that's predictable. 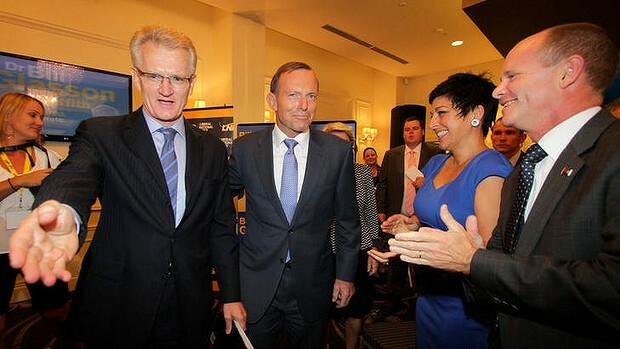 Nor is the issue Abbott's personal style and presentation. Think back to 1997 and remember how ridiculous John Howard looked, traversing the country in heavy-rimmed glasses and wearing a (particularly unpopular) style of Akubra. The point is that after his election Howard – although later demonised by the left – found a story and stuck to it. He alienated one of his core constituencies by introducing gun control; was forced to weed out ministers who hadn't lived up to his code of conduct; and took steps to introduce the GST, a vitally needed tax reform, the GST. His story, back then, was that he was acting “for the good of the country”. Howard made enemies and was hammered. That's what happens to politicians who go to the ballot box promising tax increases. Nevertheless, despite everything that subsequently occurred and his later backflips, the events of that first term established Howard’s reputation. He was perceived as having a clear view of the way the world worked, standing for something and, although he proved time and time again willing to trade items on his agenda for continuing electoral success, It was always assumed that he was working towards a decisive agenda. Abbott's problem is twofold: legitimacy and narrative. The debate over Australia Network is exactly what he required – tactically. He's been able to identify a symbol, engage in a fight over a cultural interpretation of reality, and shortly will announce funding cuts that will leave him the uncontested victor in this arena. Labor has decided protecting the Network is not a battle worth fighting. Malcolm Turnbull will correctly claim that "technical developments" have rendered the old model of International broadcasting as obsolete as shortwave radio. But that’s not why the fight is relevant. It’s important because it allows Abbot to pretend that he is doing something to seize control of the country and reshaping Australia in his image. This is the crux of legitimacy. It needs to be seized. Kevin Rudd did it back in 2007 when his first task as Prime Minister was rushing to Bali to sign Australia up as a combatant in the fight against climate change. Such actions occur on a purely symbolic level. They don't actually "mean" anything, because they don't really affect anyone. That’s why they work. These actions simply display the fact that a new prime minister has seized control of the wheel and is now steering the country. It changes the tone of the national conversation, driving home the realisation a new government is in power. Symbolism was Rudd’s forte. Flying to Bali, issuing the Apology, the 20:20 summit, schoolchildren learning foreign languages, even a new Defence White Paper to establish a secure foundation for the future. Rudd used these as props to define his narrative. The story he told was simple. It was one of a country using research and analysis to chart the best path into the future. And we believed . . . until it all suddenly fell apart when we woke early one morning and read Lenore Taylor’s story about how Rudd was abandoning the carbon tax. From that moment things began to unravel. His narrative lacked coherence. He’d insisted that action on climate change was non-negotiable, now it seemed this could be traded away. Just what was real? He lost control of his own narrative and from then on suffered by being defined by others; first Julia Gillard; later Abbott. Now a new PM is facing the same problem. Go back to Howard again. He traded on one clear message. That first budget was horrific because everything was slashed. Everything, including Defence, business, and the farmers. There were no exemptions. That’s how Howard kept control of the narrative. Hiss one simple priority was to cut. That, we were told, was the only way to recovery. Abbott isn't controlling his narrative in the way his hero did. No details have been leaked but it's evident the razor will be applied selectively, instead of shaving across the board. There are even suggestions favoured constituencies like farmers might receive more money. That's not the way these stories work. How can there be money for some farmers but none for packing workers or stone-fruit producers or car assembly plants? A good narrative is simple and coherent. No exemptions or justifications. If the storyline insists good government requires the abandoning of support for SPC, then you can't make an exception for Cadburys. If the tale requires cuts to higher education, you won't be able to pour money into private schools. The final issue is the turn-back policy. Middle Australia does want the boats to stop. Abbott’s assuring us this is happening, but transparency is the key. Voters will accept a lot, but not being lied to. When evidence emerges that casts doubt on the government’s narrative, things begin to fall apart. Like Rudd, Abbott’s risking losing control of his own story. He needs to turn things round quickly.